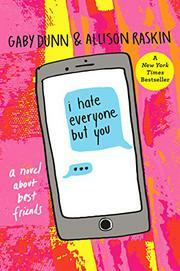 A frenetic epistolary novel of friends weathering their freshman years of college. Best friends Ava and Gen (thinly veiled fictionalized versions of YouTube comedy duo–turned-authors Dunn and Raskin) couldn’t be more different. Ava is a straight-laced, straight, white aspiring screenwriter who suffers from anxiety and comes from a loving family. Gen is a free-spirited, queer, white budding reporter who isn’t afraid to take risks and has largely absent parents. While Ava is at the University of Southern California and Gen is attending Emerson, they maintain their long-distance friendship through continual, hyperbolic emails and text messages. Ava rushes a sorority, writes and produces a short film, and loses her virginity, while Gen joins the newspaper staff, has an affair with a teaching assistant, and tries cocaine for the first time. There are rapid-fire accusations, misunderstandings, and apologies as each young woman tries to manage the consequences of her own actions while still supporting and responding to the actions of her friend. While the authors explore real issues here, including cutting, alcoholism, and gender identity, much of it is lost in the manic back-and-forth dialogue that seems more concerned with cracking jokes than plumbing depths. What might be funny in a 3-minute video quickly becomes wearying in a 300-page novel.